Why Are People Arrested at the RNC Still In Jail? The ACLU is raising an urgent concern, and believes they may be held until after the RNC ends. Cleveland—Demonstrations have been relatively muted at the Republican National Convention, and there have been very few arrests. But the American Civil Liberties Union of Ohio is raising an urgent alarm that sixteen people arrested on Wednesday afternoon are still in detention and have not seen a judge nor had an opportunity to post bail. 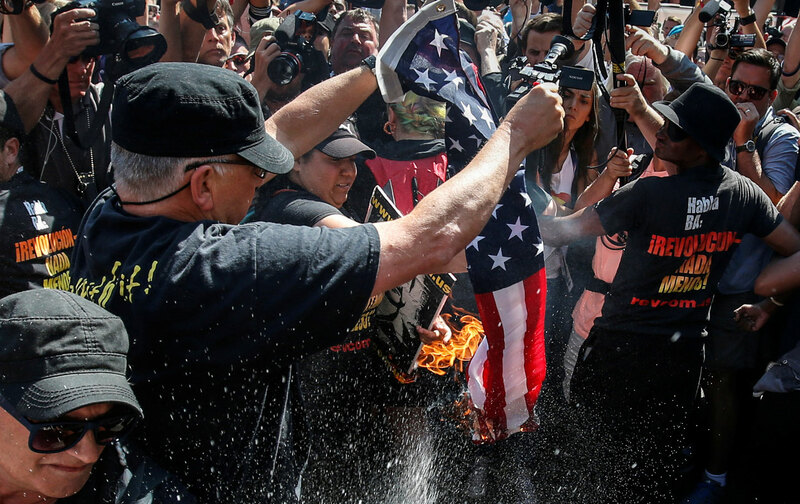 The arrest occurred around 4 pm Wednesday when an activist from the Revolutionary Communist Party began to burn a flag. The man was arrested, as were 15 other bystanders, including a photojournalist, for allegedly failing to obey an order from police to disperse. Twenty-four hours later, those people are still in detention and have not seen a judge. A hearing scheduled for 4 pm Thursday did not occur, and the ACLU is skeptical of the excuses given by prosecutors and court officials. “It’s been a series of, ‘Oh the door to the courtroom was accidentally locked. They have the lawyers on one floor, and defendants on the another.’ It’s really bogus, just bogus,” said Christine Link, executive director of the ACLU of Ohio. The arrestees have spoken with legal representation from the National Lawyer’s Guild of Ohio. The Nation was unable to immediately reach the Cuyahoga County district attorney’s office. The delays are exceptionally strange, because ignoring a dispersal order is generally handled with a ticket to appear in court at a later date, and many of these cases are later dismissed. Moreover, leading up to the convention the city claimed it was ready to handle hundreds or even thousands of mass arrests. The Cleveland Municipal Court has been cleared for the week and isn’t even hearing any cases that do not involve arrests around the RNC. There’s a precedent for that kind of treatment in Cleveland—and the ACLU of Ohio already went to court to prevent it from happening again, or so they thought. Last year when 71 people were arrested for protesting the acquittal of Cleveland police officer Michael Brelo, several people who were also arrested for allegedly failing to disperse were driven around the city in vans and didn’t show up to the jail for six hours, presumably to prevent the protesters from posting a small bail and hitting the street again. The ACLU went to court and a judge ordered that similar arrests be handled expeditiously, but that doesn’t seem to be happening. The arrests themselves are suspect, Link believes. The police say they gave audible orders to disperse, which they are required to do before arresting anybody. But Link said, “We’ve looked at half a dozen tapes from different vantages and we can’t hear or see any dispersal order, and the reporters and Lawyer’s Guild observers did not see or hear a dispersal either.” That a journalist documenting the event was also arrested has added to the concerns. If Link is right, the charges against these 16 people will be quickly dismissed. But it’s anyone’s guess at this point when they will actually get inside a courtroom.